Several of you (Emily, Mel) have sent me links to this artist, Liz Tran, over the last few weeks — thank you very much! Of course I love her work. She's even painted dresses she wanted but couldn't afford, like a red strapless taffeta number with giant white polka dots. 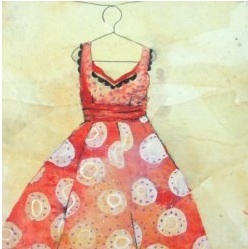 "After I sold the painting, I bought the dress," says a victorious Tran. Now that's a woman after my own heart. And I love the idea of trading a representation of a thing for the thing itself … imagine going up to a hot dog cart and trading a sketch of a hot dog for something warm and covered in mustard. It's just so intellectually satisfying! Tran's art isn't terribly expensive — the biggest ones seem to run only about $700 — so if you have an art jones this would be a good away to satisfy it! There’s a bathroom in the Beverly Hills Hotel that has, in each stall, a sketch of a food-themed dress. I think you’d get a kick out of them! Of course, I don’t remember the artist or anything. I too love the idea of trading a representation of a thing for the actual thing. I wonder if anyone has done this more intentionally, artistically speaking. Looks like the perfect collaborator for the Secret Lives of Dresses book! Tran’s work is just wonderful and expressive! thanks for the link. charming and very original artwork! thanks for the link — it’s good of you to point out other artists.